A very Merry Christmas to you from the moveable feast that is Stitch Witches headquarters. 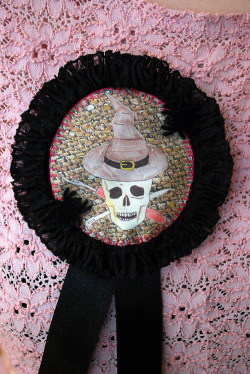 As I sit, stuffed as the turkey I’m stuffed with, glass of red in hand, I ponder how to make the glitter-covered (a Stitch Witches must) festive season just a touch more… ghoulish. 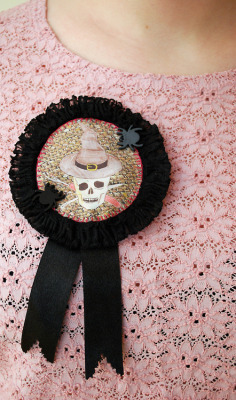 Possibly with the addition of a Stitch Witches rosette, printed with an illustration by Hanecdote and adorned with spiders, scaredy cats, or spluttering slime green candles? 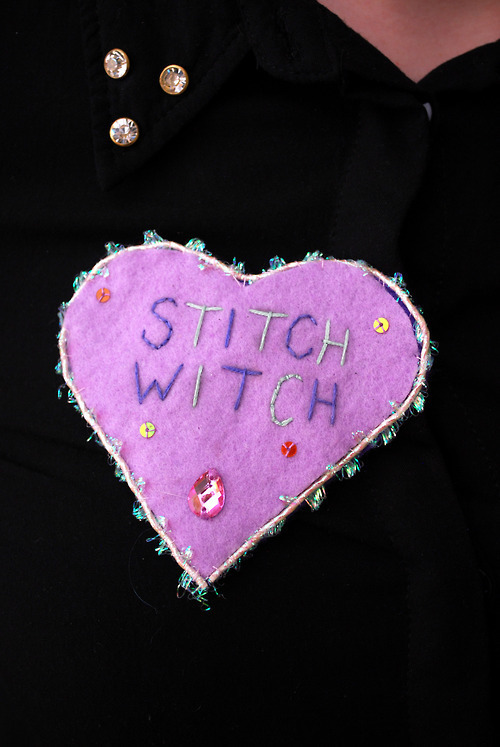 Or an otherworldy Stitch Witches loveheart brooch, decorated with ghostly green and lavender gems and sequins? These and more will be available to buy (or perhaps even win) in the run up to the release of Stitch Witches zine #1. The zine is coming on apace; here is my most recently completed page for it; I won’t give anything else away apart from to say that Polly Kettle is an artistic alter-ego of mine, and certainly lives up to her “mystifying” tag line. 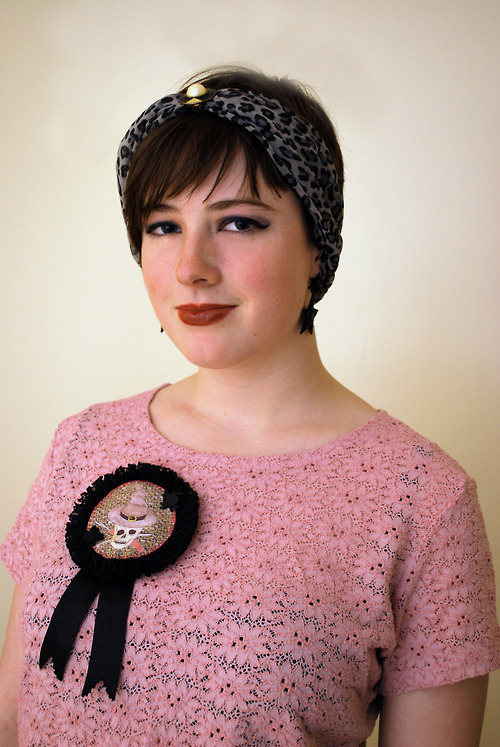 Hannah is something of a one-woman stitching machine, constantly churning out occult-themed t shirts and accessories (but only of the highest quality), many of which are inspired by Stitch Witches, or will appear in its pages or in other merchandise. We’ve both been featured (or are about to be featured!) in other zines over the past couple of months. 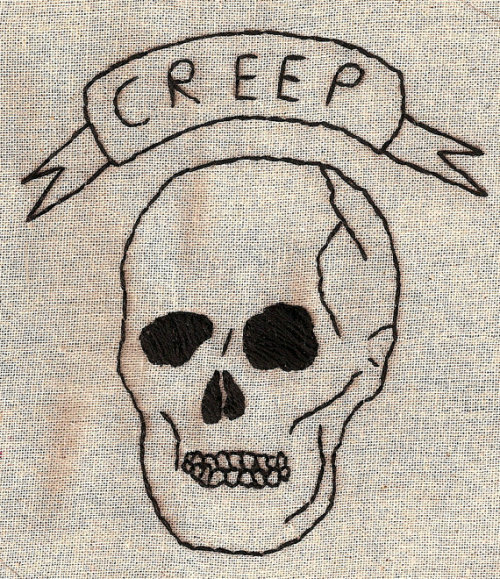 Hannah’s “CREEP” patch above will appear in OOMK zine, along with (fingers crossed) a piece by me on putting on an exhibition in my parents’ bay window this summer. One thing’s for sure this Christmas; Stitch Witches are certainly on the up. I’m looking forward to 2013, and all the creativity it will bring, immensely. All that remains to be said is, once again, Merry Christmas to all, and to all a good ghoulish night.